The Drawer 65 Stainless Steel (INOX) is a 2.3 cubic food, space-saving, front-opened marine refrigerator drawer with a rugged yet handsome 316 grade brushed stainless steel door. Its new design is based on the standard 65 liter refrigerator but in a pull-out drawer featuring an innovative interior concept with bins and bottle racks. 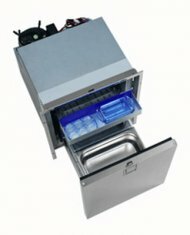 The Drawer 65 features an internal freezer drawer, a shelf with storage for 12 ounce cans and a caddy that holds three wine bottles. A sequence of 5 LED lights provides blue internal light. 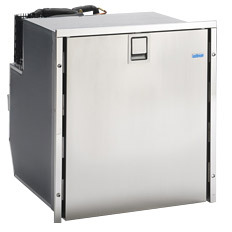 Isotherm Drawer 65, refrigerator and freezer. AC/DC with special brackets for 3/4" wood panel front.